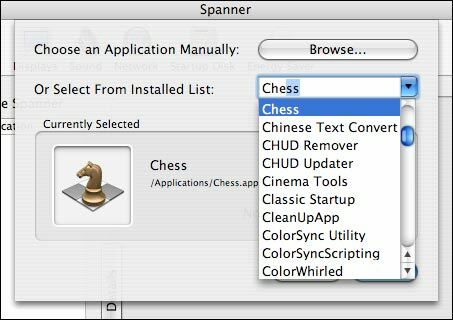 Arboreal Software, the makers of Romeo, are proud to present Spanner 0.7 - a significant upgrade from previous versions. The new Spanner Preferences Pane allows users to add any application on their drives to a watch list, and to perform customizable actions when those applications are launched or quit. The original function of Spanner - a menuling to provide easy toggling of hot corners - is still available as Spannerling. 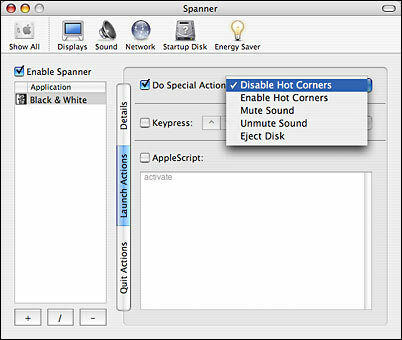 Spannerling now uses the System calls as opposed to restarting the Dock. Creation of prefpane, allowing assignation of launch and quit actions to any application. Easy selection of any application via a Browse dialog or from a drop-down list. Assign special actions, keypress emulation or AppleScript actions. Download Spanner here. If you have feedback or bug reports, please email us.